A universal short crust pastry easily catering for both sweet and savory fillings. 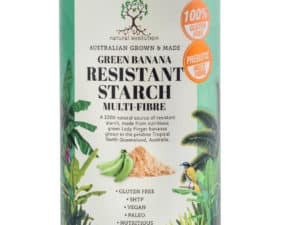 Made entirely of green banana flour, completely gluten and grain free, also containing a healthy dose of resistant starch and essential vitamins and minerals – due the super nutrition of the green banana flour. 1.Place all ingredients in Thermomix(TM), food processor or similar. TM users mix gently on speed 2 for 10 seconds and gradually work up to speed 6 for a further 30 seconds. Whatever mixing method you use from elbow grease to TM or food processor ensure that the mixture is well combined – it will have a soft dough like consistency. 2. Gather mixture into a ball, place in a bowl and set aside for 20 minutes in the fridge. The more you handle the mixture the more the butter will melt and become sticky – if this happens simply place in the fridge or freezer to firm up the pastry. When removing from the fridge or freezer the dough may feel hard but gently knead the mixture and as it warms it will become flexible. 3. Roll mixture between two sheets of grease proof paper. Use pastry molds or cutters to make required shape etc. Gently peel from paper and use as required. This pastry can easily be used for sweet, savory, flans, pies, quiche or anywhere that pastry is required. For a sweet tasting short crust pastry you can add 1 tablespoon of honey or 2 tablespoons of sugar. Key point to remember is that this pastry is very forgiving! Fridge or freezer to firm up, knead/roll to warm – if it gets sticky back to the fridge or freezer. In total between welcoming home my husband and tending to my children and fur babies my batch was in and out of the freezer/fridge about 5 or 6 times! Enjoy this delicious, easy, gluten free short crust pastry.